As the second World War progressed, thoughts at ‘The’ Alvis began to turn to the future role of the Company after the end of the war. It was by no means certain that car production would resume. The Company was successfully producing munitions/aircraft parts and there was a strong argument to continue on with that profitable work and draw a line on car production. Some did believe it was right to return to car production. Those who favoured returning to car production included A. F. Varney & William Dunn. Thoughts as to exactly what to build also identified differences of opinion. Some thought it best to return to the large sports cars of the 1930s and the taster adverts that appeared in wartime magazines indicated that such a car would be produced. Others, with feet more firmly rooted on the ground, envisaged a smaller car that would use less scarce materials and would be within the purchasing power of the post war car buying public. Once the decision was made as to the smaller design of the car thoughts turned to resurrecting, enlarging and slightly modernising the pre-war 12/70. The 12/70 does not always get the attention it deserves but forever holds the lap record at 110mph (114mph in practice) for the last ever race at the Brooklands circuit. As such this must be a great endorsement for the capabilities of its derivative the TA 14. Late in 1945, advertisements began to appear in the Motoring Press giving the public a view of the new model as envisaged it would appear in Saloon form. Alvis kept to the principle that they would produce the running chassis with front wings and that the car would be bodied by an external coachbuilder to a design and price agreed with Alvis. Initially Charlesworth had found favour, but had to withdraw as they could not agree to the price and numbers. It had also been felt that they would have to completely retool for the new body as those tools for the Speed 25 had been lost during the war. That is until Arthur Varney was discussing the issue in the Mill House Hotel, Bagington, Coventry and was overhead by a fellow patron. For those who do not believe in coincidences look away now. The story this gentleman told was that all the Speed 25 body tools had been put into the bottom of a naval gun barrel quenching pit 100ft deep. Sceptical but buoyed up by the certainty given to the story, the pit was drained by the fire brigade and there at the bottom lay all the body tooling equipment in good condition perhaps not a coincidence but a miracle. The first chassis number for the TA 14 is 20500 and that proclaims a Charlesworth body. Mulliners came to the fore and were able to offer bodies at an acceptable price of £125 to £200 per car. These completed bodies would then be returned to the Alvis factory for painting and retrimming. Alvis wanted to have several catalogued models of the Fourteen that could be ordered as specific cars and so negotiations with a number of coachbuilders were finalised so that after the war the public had a choice. Alvis could make more chassis than their ability to sell finished cars They offered 1000 chassis, particularly during the early production run, giving customers the opportunity to buy a running chassis to be bodied by other Coachbuilders or enterprising ‘craftsmen’ who put together something that resembled a car body with varying degrees of success. Particularly in the early days of production, boat builders and even a packing case manufacturers turned their hands to creating utility vehicles. The constraints of an austere post-war Britain were considerable and lack of steel, power, double purchase tax on cars costing over £1000, £1 per horse power tax and the need to export were all factors affecting the Fourteen. In many ways, reverting to a mid range 4 cylinder car was to remain true to T.G. John’s original vision of Alvis building smaller high quality cars. The main technical modifications from the 12/70 specification were to add 2 inches onto the wheelbase of the cars. In addition 4 inches were added to the track and a 1 millimetre increase in the bore diameter. The body dimension changes allowed for the appearance of a more ample car forgoing the leaner appearance of the pre war 12/70 and modernising with no running boards. For some Mulliners owners there was also the opportunity to specify the body 1 inch higher. The coachwork styles can trace their origins back further through the 12/70 lineage. As an example the original 12/70 saloon body was a design by James Wignall for a Rolls Royce 25/30 owned by Mulliners’ Chief, Louis Antweiler that was actually constructed and ran. In 1945 the advertisements began to appear confirming ‘the reconversion of the Company’s productive facilities’ and the slogan developed for the cars was ‘Individuality’. ‘The New Fourteen’ was promoted as the first of their post-war models with deliveries intended to commence in the Spring of 1946. Sadly, at the time, the Fourteen was viewed by many at ‘The’ Alvis as a stop-gap model and almost immediately plans were put in place to develop the 3 litre model. For a ‘stop gap’ the TA 14 did remarkably well. More Fourteens were produced than any other model in the Company’s history. More have survived than any other model, much due to the robustness of building and construction. Accountants had yet to run car companies! At a 1940s Motor Show a man was seen to feel the thickness of the front wing metal and exclaim there was enough metal there to make a Ford Anglia! In 1948 it became the only post war Alvis car to make a profit. The actual cost of warranties at £9 per car came in dramatically lower than the budgeted £15. The Fourteen running chassis was to have the widest range of body styles of any Alvis Model. 3 main styles were promoted to delight the post war purchaser. The saloon car by Mulliners, the Drop Head Coupe by Carbodies and the two seater TB 14 roadster by A. P. Metalcraft. In addition the 1000 chassis were made available to be bodied by third parties and sent back to Alvis for Guarantee approval (or not). Smaller specialist coach builders such as Tickford and Duncan were also able to put their skills to work on the model. No other model in the Alvis range can come close to boasting such a wide range of bodies including the production of Ice Cream vans with their glorious paintwork, to an all-enclosed 2 seater racing car with a vast boot as the chassis would have dictated. This led one eminent motoring historian to describe the styling as akin to an upturned pram! The racing driver, L. Eggen sought support from Alvis with the Belgian bodied racing car and one wonders at their reaction to a racing TA 14 following on from the successful pre war race cars? Sadly the car, running under no. 32 and with co driver E. Kraft de la Saux, was a non finisher at Le Mans due to big end failure. Fortunately today many versions of TA 14s have survived to demonstrate the strength and style of this increasingly popular and sought after Model still residing all over the world. Some now reside with their second generation owners and now third generation owners are taking over their childhood friend. Many cars increasingly look as good as the day they were ‘born’ and others, whose body work was found to be beyond repair, have been rescued and turned into some rather wonderful Specials. Who would have thought in 1946 that we could now boast a Mahogany Duck Back Special or a Hot Rod as additions to the Fourteen stable. Lamentably so far no one has reproduced the iconic Ice Cream Vans. The TA 14 has established itself as one of the most popular models made by Alvis. Prices have risen steadily over recent years particularly for the Drophead Models and TB 14s. The world has changed almost beyond recognition since 1946. A period of time in reverse that would take us back to 1876, almost the dawn of the Motor Car. The manufacture of Alvis Cars from 1919 to 1967 is already a far shorter period than TA14s have been in existence. The final chassis no. 23830 ran off the production line in December 1950 and the Model became history, the world moved on but the TA14 remains one of the most popular cars the Company ever built and has captured a devoted following of owners thus ensuring their place in the future. Taking a Crystal ball to look forward over the next 70 years will no doubt show tremendous changes towards the end of the 21st Century. Many of the Fourteens around now should still be going strong in the hands of caring owners. Fettling of the cars will increasingly be undertaken by specialists as modern day motoring does not develop those skills. Driving is likely to get less with the increasing age of the cars and intensification of traffic. Fewer long distance journeys will probably become the norm for most. Owners are already taking a much greater interest in the provenance of their cars. Increasing numbers are likely to migrate to countries such as Germany and the Netherlands. The Global spread covers over 15 countries around the globe and is rising. For the increasingly scarce car beyond economic restoration there is a steady demand for the chassis to produce Specials particularly for the German market. For a car that was once rather looked down upon as a Cinderella car the Fourteen is mow recognized all over the world as one, if not the finest cars Alvis ever built. The Mulliners Sports Saloon was the main version of the 4 year TA 14 production run. 1775 were made out of a production run of 3313 chassis. Alvis had investigated Charlesworth and other Coachbuilders but none could or would meet their production needs. With 1100 orders for car’s to be fulfilled and running chassis rolling off the production line Alvis turned to Mulliners. There seems to have been some suspicion over this arrangement on both sides. Alvis were worried that Mulliners might produce a more modern car body for their competitors that might highlight the prewar style of the TA 14 and thus damage sales and the Company’s reputation. Following negotiations, a price was agreed and production of the new bodies began. The first 3 bodies presented to Alvis by Mulliners were rejected as being of poor quality. Alvis reputation as a manufacturer of quality car’s hung on the shoulders of the TA 14 and it was vital that the new car should not detract from that reputation. Eventually bodies were produced of sufficient quality. Despite the Alvis factory having been destroyed in 1940 by a 2000lb bomb, six years later to the day after that destruction, 3 dealers and their wives came to take delivery of the first three Mulliners saloons off the production line. It had not been an easy path to that moment. Mulliners bodies were made of steel and the original plan was to offer the ‘2 litre’ version together with a 3 litre engine option. The latter proved to be too ambitious and it was left to the sturdy 2 litre engine to carry the marque through to the 1950s and production of the 3 litres, although the TA 14 provided 3 prototype chassis for the development of the 3 litre model the TA 21. The Mulliners was described as a Sports Saloon and the adverts of the day describe the handling as ‘holding the road beautifully at speed without roll or sway’. The standard car came with an opening windscreen and all were fitted with a sliding Sunroof unless otherwise specified. Sadly many a Saloon met it’s fate due to extensive corrosion caused by blocked channels in the Sunroof and consequential rust. For 3 years the Mulliners Saloon was the mainstay of Fourteen production. As it aged it became one of the less appreciated of the TA 14s. Fortunately the passage of time has shown what a good car the Saloon is and the increasing number of restored Saloons show why the car was so popular and produced a steady stream of orders. Having successfully bid to become the catalogued drophead of choice for Alvis they gave a price of £195 per body with a minimum order of 500. In the end they only produced 400. Visually the line of chrome strips behind the back window is one of the key designs that differentiates a Carbodies from a Tickford or other Drophead. Also the original hood style is single skinned and unlined. This gives the car more of a feel of a convertible when the hood is up. To a degree Carbodies worked down to a price for Alvis whereas the customers for the higher end drophead supplied by Tickford were felt to be less price sensitive. One great benefit for Carbodies owners over the years has been substantially lower costs when commissioning a new hood and retrimming the car. Today there is not much differentiation between the value of a Carbodies as opposed to a Tickford, the price being determined by the condition. Alvis intended to limit the catalogued drophead version to Carbodies but the volume of chassis production meant that more Coachbuilders were needed to keep up with chassis production. Tickford of Newport Pagnell were approached and agreed to become involved. Tickford were known for the production of high specification bodies, in terms of body, hood and trim. The main differences from other TA 14 dropheads is that the body is made of light alloy panels on ash frames producing a lighter car. To identify the Tickford visually the hood is a good illustration with pram irons, a small glass rear window and being double skinned with a horse hair filling. Today many Tickfords sport cheaper hoods with a larger plastic rear window but most still carry their pram irons, thus avoiding the eye watering cost of replicating the original hood. When the hood is to the original specification it is like driving a saloon car when the hood is up. The interior trim and carpeting is considerably more complex than that of the Carbodies. The original sale price was about £500 more than the equivalent Carbodies. For many years some owners tried to pass their Carbodies Drophead off as a Tickford. There must have been a few ‘Alvis’ men spluttering over their port when the TB 14 prototype was unveiled at the 1948 London Motor Show, the first Show after the war. Very much a Marmite car it was loved or hated. The design was based on the body produced by Bidee of Belgium. To add insult to injury the car did not carry the traditional Alvis radiator and looked as though it would be more at home cruising down the Boulevards of Santa Monica. This aberration was of course rectified when the 3 litre successor the TB21 was launched in 1951. Whilst being clad in a striking 2 seater body the TB 14 remains a TA 14 with a 2 seater body hence the need for the relatively long boot to accommodate the chassis. Twin carbs and a 4:3:1 differential were the main technical differences. Norma Raffles demonstrated the other unusual features of the car at the Motor Show. Tucked away in the wide passenger door panel was a cocktail cabinet along with a vanity unit containing lipstick, powder and perfume for the lady passenger. Neither made it into the production run of 100 although the cocktail cabinet has resurfaced occasionally in later life in some TB 14s. Possibly the most famous owner of a TB 14 was the actor James Mason but despite considerable research the chassis number and the car still remain a mystery. Alvis were pressurised heavily by the Post War government to increase the export of cars. Such pressure could not be ignored as the supply of scarce materials could be reallocated if the Company were not seen to be pulling their weight in the drive to earn foreign currency. The problem Alvis had in relation to car export was that their models were not necessarily attractive to some markets such as the Americans. The Mulliners Saloon looked decidedly old fashioned to them and was not the essential 6 cylinder engine Americans wanted. After a visit to the USA an approach was made to Duncan to investigate the construction of a more ‘modern’ looking car. Duncan had already come up with their Fixed Head Saloon. Nothing was to come of the approach by Alvis but Duncan did body several cars with their individual design. Looking very much a car designed for the post war era the pillarless saloon was also very striking when seen with the doors wide open. What an eclectic bunch! In the early days of chassis production Alvis needed to move the chassis on and with the delays in finalising catalogued models the chassis could be bought and bodied by anyone who wanted to turn their hand to creating a new post war vehicle. The road tax rules of the day made it attractive to run a utility vehicle Ron Walton’s fascinating book, ‘Young Ron’, still in print, tells amusing stories of road testing these vehicles when they returned to Alvis for approval and Guarantees. Needless to say some failed the test and there are instances of some catalogued bodies being built on chassis that had not achieved the required standard to run safely on the road. The majority of these vehicles were given bodies by reputable small coach builders and some fine examples were made that continue to thrive today. Many had busy lives in their younger days, bread delivery, furniture removal but one lucky vehicle went off to ‘work’ for Fortnum and Mason. One ‘endearing’ feature of all the models has been the windscreen wipers. Woe betide the driver when flakes of snow begin to fall. The wipers glide across the screen packing the snow either side as visibility becomes smaller and smaller until it is necessary to lower the windows to try and clear the packed snow or stopping to get out to complete the task. Either way the elements are then free to enter the car. Few are the Fourteen drivers who do not have empathy with that experience! Initially some early chassis were exported to Europe and some striking bodies were put on in Belgium and Switzerland. Some complete cars were exported to Sweden, Australia and New Zealand. Some smaller countries for example Uruguay took 11 cars. Sadly some cars, particularly the Mulliners Saloons, have been viewed in the last as beyond restoration for various reasons. There will always be a debate over preservation versus re-bodying but in some instances it has been better that part of the car has been retained for the future. In the early days many Specials produced from Fourteens were somewhat underwhelming versions but now we have examples of superb Specials. Perhaps the finest TA 14 Special is to be found today on the French roads. Created from a dilapidated and rather unsightly TA 14 Special, this car is the result of thousands of hours of painstaking work to produce a stunning 2 seater mahogany duck’s back. Equally eye catching is the TA 14 ‘Hot Rod’ in pale green powered by a Buick engine. In many respects builders of Specials on a TA 14 chassis are continuing the process of building a body onto a 1940s chassis. There will never be a time when the history and knowledge of Fourteens is complete, research continues and ‘barn finds’ still crop up. May the Force continue to be with the Fourteens, the world looks very promising for them. ‘Individuality’ still remains the watch word. Welcome to the wonderful world of Fourteens. We have now grown too large for this main site and can be accessed direct by http://alvisfourteen.wordpress.com taking you across to the main TA14/TB14 site. We hope you will enjoy and find useful the general/technical information and photos (over 1000). There is always more information being added. You can become a follower to receive regular updates or dive into the site at anytime. We are always looking for more Fourteen related information. Also why not trawl through Lost and Rogue Cars to see if you can identify any of our missing Cars. First of all my compliments with your fantastic initiative on the Alvis archive. I attach two pictures on the 1947 Geneva car show which I got via my great-uncle Frans Vrijaldenhoven (84) who is one of the best documented Automotive Historians in NL and beyond. Keep up the good work and there is more to follow from this side of the North Sea. 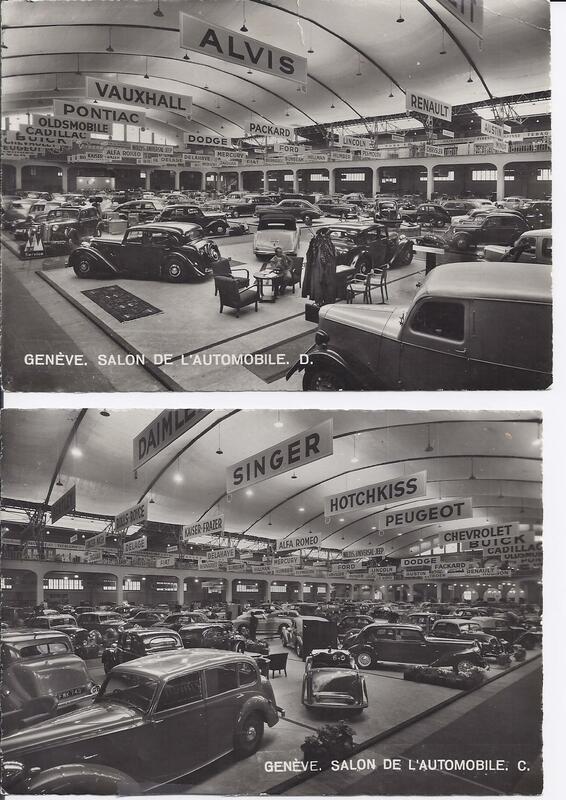 1947 First post-war continental car show Geneva (Frans was there). One of the pictures shows the Alvis Stand. If you combine the 2 pictures, with a little bit of imagination, you get an impression of the total show. Question: who built the TA 14 DHC seen from behind? Who has more pictures of the show? I’m very new to Alvis ownership, a week and some hours as I write. My car is a ’49 Mulliner saloon. I bought it from a lady in Duns and it now resides in Wemyss Bay. So you car is not alone in Scotland. Waar kan ik info vinden voor het afstellen van een carburator van een alvis ta 14 ? Afstellen van vooronsteking ? Where can I find info for adjusting a carburetor of an alvis ta 14? Adjusting pre-inflammation? Uw aanvraag is aan mij doorgegeven. Ga naar onze Alvis Archive TA 14-website op http://www.alvisfourteen.wordpress.com en zoek technische gegevens op. Blader naar beneden en je vindt een kopie van de Carburettor-folder met de instellingsinformatie. Kom later terug als je meer informatie nodig hebt. Tijdens het schrijven kon je me het chassisnummer en de registratie voor de auto laten hebben? We zijn altijd geïnteresseerd in het vinden van Alvis Cars die Groot-Brittannië hebben verlaten. Met het chassisnummer en de registratie kan ik de geschiedenis van de auto aan de eigenaar verstrekken. Thanks Eileen, for an excellent history. As a recent purchaser of a Fourteen Tickford DHC (which may be the only one in Australia), I have found Eileen to be a wonderful source of priceless information, particularly when one of the pram irons snapped on a recent tour of Tasmania. I also have the privilege of owning a TA21G Graber FHC, a TE21 FHC & a TF21FHC. They are all fine cars, but the Fourteen is something special. To motor down the country roads where I live north of Melbourne, with the hood fully down on an autumnal day is something special – that car is alive, in a way the 3 Litres aren’t. One can almost feel the spirit of the men who built her at Holyhead Road, all those years ago. Further to my earlier post, my wife Pauline and I recently purchased a Fourteen DHC with coachwork by Tickford/Richard Mead. Alex Simpson of Earley Engineering attended the auction and obtained the purchase for us. Alex and his team then got the car ready for use on our visit to England in September. She (we have called her Maud) has a Tickford MG WA body that Richard Mead bought from Tickfords after WWII and fitted to a Fourteen chassis. Pauline and I recently spent some happy days touring around the Cotswolds in Maud, who performed splendidly, notwithstanding that it rained every day. We plan to use her again on our next visit in mid-2019. Many thanks to Alex Simpson and his team and to Eileen Goddin for her invaluable information.